Erica recurvata is a critically endangered species that was previously known only from a botanical painting published by Henry Charles Andrews between 1794 and 1830. 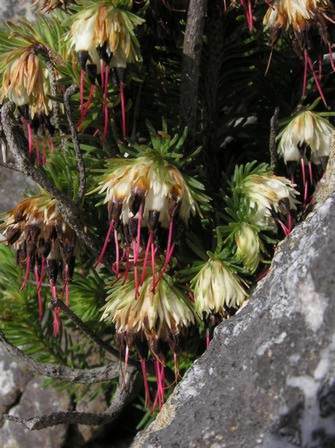 This bonsai-like erica, with its striking hanging flowers, was only rediscovered in 2007 by botanist Ross Turner and is known from two populations of 34 individuals. Erica recurvata is a small shrub growing of 0.3-0.6m in ideal conditions. In nature, it has only been found tucked into rock crevices, and what are thought to be very old individuals, have a bonsai-like appearance. The plants are branched and the stems are covered with whorled, pale-green, linear, ericoid leaves. At the tips of branches, leaves encircle a drooping cluster of white and brown flowers with bright red styles that protrude beyond the petals. The flowers are about the size of a thumbnail, slightly sticky and appear in the winter months. Erica recurvata is Red Listed as Critically Endangered. Not only are there very few individuals known, but its habitat and immediate surroundings are scattered with alien invasive plants and have been burned frequently. It is thought that the existing plants have survived these frequent fires by being protected within rocky outcrops. 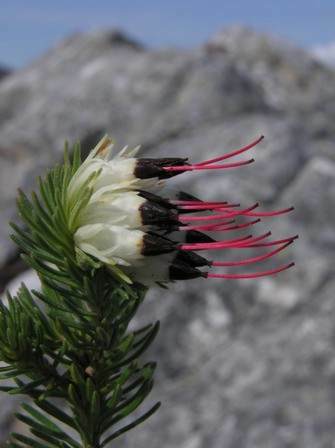 Erica recurvata was (re)discovered in the Napier Mountains in the Western Cape, South Africa. Although their preferred habitat is Overberg Sandstone Fynbos, the plants have only been found in rocky outcrops where they grow wedged in clefts in the rocks. 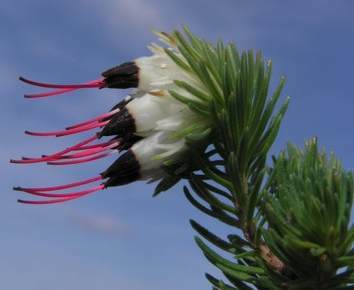 The genus Erica belongs to the family Ericaceae, which is one of the distinctive and the largest genera comprising the South African fynbos flora. About 760 of the 860 Erica species occur in South Africa. Most Erica species have so-called ericoid or needle-like leaves with a narrow channel beneath which are borne in whorls around the stems. Flowers vary in size depending on species and petals are fused to form a corolla tube either narrow, or open and bell-shaped. Ericas grow naturally in many different habitats from coastal flats, marshes and rivers, to mountain peaks. The fruit is usually a loculicidal capsule (a capsule that dehisces by splitting down the middle of the locules) but can be an indehiscent capsule, drupe, achene or berry. Erica seed is extremely small and fine, and in all species, except for Erica sessiliflora , they are shed after ripening. For 200 years, Erica recurvata , so named for its recurved leaves, was known only from a painting in Andrews' Coloured Engravings of Heaths published between 1794 and 1830. 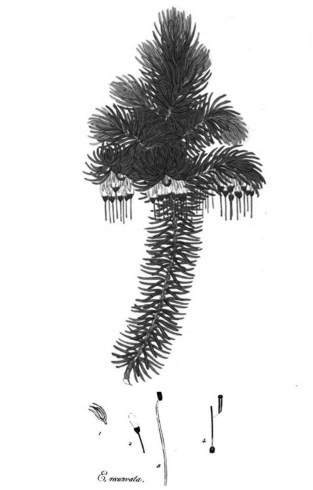 It was thought that the paintings were of a hybrid developed at Kew Gardens, until living specimens, growing naturally in the Napier Mountains were discovered by Ross Turner. Ted Oliver recognised it as the Erica in Andrews' painting, and speculated that the plant was grown from seed collected in the late 1700s to early 1800s and sent to England by James Nivens (1776-1827), an early plant collector in the Cape. The seed was grown to flowering stage from which the botanical drawings were made and specimens taken and stored at Kew and other United Kingdom herbaria. It is thought that the plants found in the Napier Mountains, could be the very same plants from which this seed was collected. Having only recently been (re)discovered, its precise ecology is largely unknown, and research is still underway for this species. Although Erica recurvata occurs within the Fynbos Biome, a naturally fire driven system, they seem to prefer protection from fire and it is thought that the existing plants are extremely old. Many ericas are pollinated by sunbirds and this may also be the case for E. recurvata. There are no known medicinal or magical uses recorded for Erica recurvata, however as a horticultural garden plant, should it be cultivated, it would add beauty and interest to a rockery. Erica recurvata has been successfully propagated by seed and cuttings. Collect the seed just as it starts to fall naturally and sow in autumn. Of all Erica species that have been tested for germination response to smoke treatment, 66% showed improved germination. It would therefore be advantageous to pre-soak E. recurvata seeds in an aqueous smoke extract or seed primer for 24 hours before sowing. Use a well-drained, acidic sowing medium and firm down the surface of the medium. To prevent damping off, sow seeds evenly by mixing it with fine sand prior to sowing. A thin layer of propagation medium can be sieved over the seeds. Water the seeds with a very fine hose to prevent dislodging them and place containers under cover in a shade house until the seeds germinate. Take cuttings from healthy, disease free plants about two months after flowering. At this stage, the plants would have grown shoots that are semi-hard. Nodal cuttings can be used, although heel-cuttings are most suitable. Carefully remove the leaves on the lower third, dip the cuttings into a rooting hormone and insert into a cutting medium of one part milled bark and one part polystyrene. Place the cuttings in a greenhouse with intermittent mist or in an open air mist spraying unit. Erica cuttings require good air circulation. When the cuttings have rooted well, they can be planted into pots in the same growing medium as for seedlings. When the seedlings are 10mm tall and the cuttings are well established, they can be placed in an open, but lightly shaded area. Ericas require good air circulation at all times. When seedlings are 20-50mm in height, prick them out and plant into pots or plant bags. Ericas have very sensitive hair-like roots situated close to the surface of the medium and disturbance of these roots should be minimal. Like the propagation medium, the potting soil should be well-drained and acidic. A sandy loam with 50% humus, a pH of between 5 and 5.5, and low levels of phosphate is recommended. Three parts sand, two parts leaf mould/bark and one part soil can also be used. A mulch consisting of untreated woodchips, pine needles or stones can be placed around the plant on the surface of the potting medium to protect the delicate roots, keep them moist and cool, and to suppress weed growth. Once the plants are established, they can be moved out into the open. Water the plants well every second or third day, preferably in the mornings to prevent fungal infections from developing on the leaves. Fertilise with organic liquid fertilisers such as those derived from seaweeds, or a controlled-release granular fertiliser that is low in phosphate. Andrews, H.C. 1809. The Heathery: Or, A Monograph of the Genus Erica with Latin and English Descriptions, Dissections, Etc. of All the Known Species of that Extensive and Distinguished Tribe of Plants , volumes 5-6. Brown, N.A.C. & Botha, P.A. 2004. Smoke seed germination studies and a guide to seed propagation of plants from the major families of the Cape Floristic Region, South Africa. South African Journal of Botany 70(4): 599-581. Brown, N. & Duncan, G. 2006. Grow Fynbos Plants, A practical guide to the propagation and cultivation of plants from some of the major families of the Cape Floristic Region of South Africa. South African National Biodiversity Institute, Cape Town. Goldblatt, P. & Manning, J. 2000. Cape Plants. 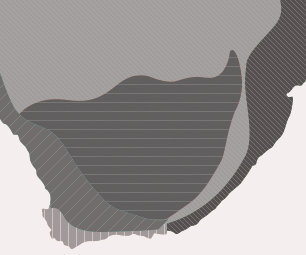 A conspectus of the Cape flora of South Africa. Strelitzia 9. National Botanical Institute, Cape Town & Missouri Botanical Garden, St. Louis. Kotze, F.G. 1987. Ericas: Propagation and Growing . South African National Biodiversity Institute, Cape Town. Voget, C. (ed.). 1998. Grow South African plants. A gardeners' companion to indigenous plants. National Botanical Institute, Cape Town. Patterson, J. The critically rare Erica recurvata, Western Cape, South Africa . Simms, J. 1835. Curtis' Botanical Magazine, Or, Flower-garden Displayed: In which the Most Ornamental Foreign Plants, Cultivated in the Open Ground, the Green-house, and the Stove, are Accurately Represented in Their Natural Colours , volume 62. Wakfer, C. 2012. Herbs . Hermanus Botanical Society News. Raimondo, D., Grieve. K., Helme, N., Koopman, R. & Ebrahim, I. (eds). 2013. Plants in Peril. SANBI Publishing, Pretoria.